2x Award Winning Actress & founding member of the theater company 'At Play Productions', Stefanie Estes, stops by to chat with Dini about starring in the new American Horror flick, "Bethany", she plays the leading role as Claire, a wife, who finds herself along with her husband moving back into Claire's childhood home only to have the abusive and traumatic memories of her mother come back to haunt her. Set your reminders, it's ... Más informaciones happening! 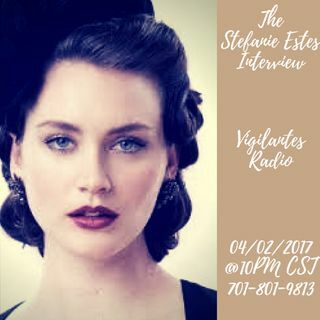 03/28/2017 | @10PM Central Standard Time | Call in at 701-801-9813 | You can also hop in the mix by visiting www.onlyonemediagroup.com/vigilantes-radio-blog and slapping that "Go Live" button | Please follow our show at www.spreaker.com/onlyonemediagroup & remember sharing is caring! Thanks for your continuous support!